Buildings have become increasingly lighter in weight over the past 100 years, which means that the amount of pure mass in them is reduced compared to prior eras. In the process, a significant thermal benefit was lost which is now being realized and incorporated again into green buildings. 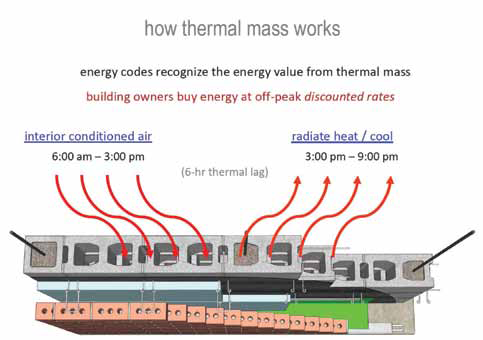 The physics of returning mass to a building allows the space to be thermally tempered; thermal mass slows the rate of temperature swings in a space creating a slower thermal lag. A key component in sustainable design is an energy efficient building envelope. Architects now consider both the thermal mass of the materials as well as the insulating value when designing. Thermal mass helps to reduce indoor temperature swings and often leads to reduction in the size of mechanical heating and cooling (HVAC) systems, which is one of the biggest sources of energy use and cost. One of the easiest and most common ways of adding this thermal mass to a building is by using concrete masonry units (CMUs). However, CMUs must be located inside of the insulation layer to be truly effective for energy and comfort performance. The basic premise is simple: The thermal mass absorbs heat from the surrounding area when it is warm and re-radiates it back out thus cooling afterwards. Typically this means that the mass is absorbing heat during the daytime, helping to keep a space from overheating, and radiating at night, helping to keep a space appropriately warm. If you have ever walked into a masonry church or monument during the summertime you have likely felt the pleasant temperature difference immediately and then realized that there is likely no air conditioning at play. Peak heating and cooling loads can be reduced since the high and low temperatures of the space are moderated and temperature variations are reduced. Peak heating and cooling loads can be shifted to non-peak hours saving the owner on-peak electricity rates and saving the utility company on overall peak energy supply requirements. The size of HVAC systems can be reduced since the high and low temperature points that the systems need to perform to can likely be trimmed—hence less heating and cooling capacity is needed. Building energy codes have come to recognize the energy benefits of thermal mass with prescriptive credit and trade-offs that can be garnered to show code compliance that might otherwise be unavailable. It is important to recognize that there is a misconception that designing a building with added thermal mass will always use less energy and reduce energy costs overall. No one can realistically make that claim since there are many other variables that go into the design of a building and the systems that serve it. 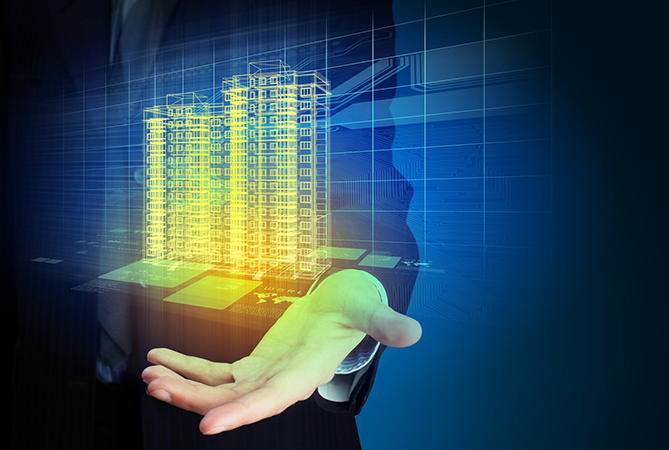 Therefore, it is important to look at the whole picture and perform computerized energy modeling if needed to see the potential energy savings for any given design. Nonetheless, adding thermal mass to a building does very often create all of the benefits stated above including the very real savings in many cases of buying energy during off peak hours. And maybe even more important to users, it is rather consistent in increasing occupant comfort. If the space is perceived as comfortable, then there is less likelihood to change the thermostat settings to a more energy-consuming level.